Luis Miguel Gallego Basteri, is a Puerto Rican born, Mexican raised singer, born on April 19, 1970. He is the son of Spanish singer, Luisito Rey and Italian actress Marcela Basteri. After his mother’s mysterious disappearance, Luis’ father died in 1992. As a child, Luis Miguel’s father, who was also his manager before his death in 2002, encouraged him to watch and analyse nearly every movie, recording and concert performance of Elvis Presley. Luis is one of the most popular singers from Latin America, and is best known for his talent in vocals. He has performed successfully in the pop, bolero, mariachi genre as well as romantic ballads. His rise to superstardom began in the 1980s, and he has won four Latin Grammy Awards and Five Grammy Awards. He is affectionately called “El Sol De México” (The Sun of Mexico) by the media and his fans. At age 11, Luis Miguel released his debut album, “Un Sol,” with the Mexican branch of EMI records. Two years later, he began his Latin American tour, which included Colombia, Venezuela, Chile and Argentina. At 15, he was a participant at the Sanremo Music Festival, where he won second place award for his song, “Noi Ragazzi Di Ogg.” He was also presented with the “Antorcha de Plata” Award in the Viña del Mar Music Festival for his duet single with Scottish singer Sheena Easton, in later that year. In 1986, after having been successful thus far, Luis Miguel took a brief hiatus as his relationship with his father, who doubled as his manager, began to sour due to mismanagement, poor financial decisions. 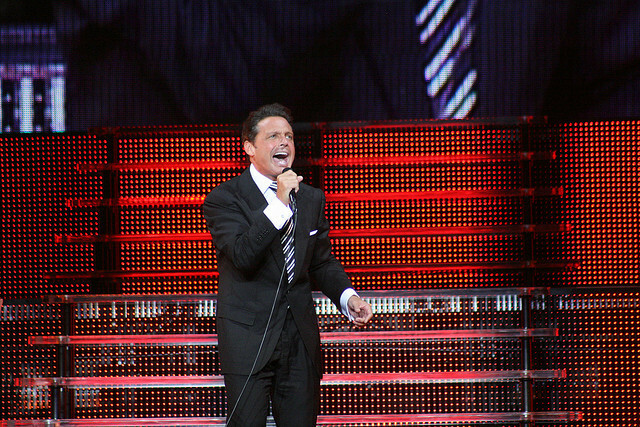 Luis Miguel fired his father in 1987, shortly after signing with Warner Records, and began working with Juan Carlos Calderón, who gave his career a remarkable boost. Luis released his sophomore album, “Busca Una Mujer,” on November 25, 1988. The first single “La Incondicional” rose to become a top-ten hit throughout Latin America in the first half of 1989, due in part to its music video. The video was shocking to many fans; Luis Miguel shopped off his signature mane which he had sported since the beginning of his career, signifying his transition from a child star into an adult superstar. The second single “Fría Como El Viento,” reached number 1 on the Hot Latin Tracks by the end of 1989. His transition from child to adult star was successful and well received, with the album “20 Años.” Subsequently, he gained a string of sold out show, first in Mexico, then throughout Latin America and other international destination. In 1991, his career ascended to even greater heights and earned him the respect of a wider audience with the release of, “Romance” an album of romantic boleros. In 1993, he won the Grammy Award for Best Latin Pop Album, for “Aries.” Three years later, Luis became one of the few Latin artists to receive a star in the Hollywood Walk of Fame.